Beauty In The Mirror: Autumn Picks / Top 3 Blushers All Under £6! Autumn Picks / Top 3 Blushers All Under £6! Since we are well into Autumn I thought I would quickly share my favourite blushers which I've been reaching for since the trees started to turn colour. I LOVE this time of year, I always go through my make up stash and change my bright corals and peaches for more autumnal shades. When I went through my blushers there was just 3 blushers which caught my eye and that's good. Sometimes you can bog yourself down with blushes. I can't believe these are all under £6, they are all very pigmented and great quality! I still can't stay away from cream blushes. I love Topshops Nutmeg, it blends well and gives a nice rustic warmth to the skin which looks beautiful and healthy. This is the most pricey of the bunch, only costing £6 which is still amazing value. 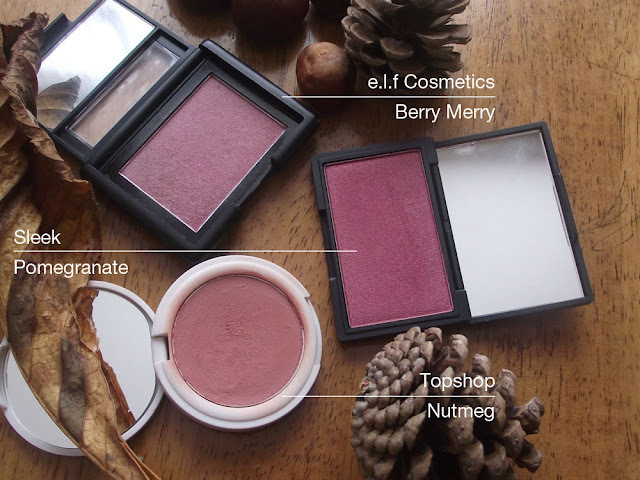 The next Blush to make to my top 3 is e.l.f Cosmetics Berry Merry blush. I did buy this last year after reading reviews it's been compared to NARS Sin. Whilst I don't have NARS Sin...yet.I have seen swatches of them both together and they do resemble a likeness in the pan but when swatched NARS Sin is more purple/mauve toned. But seeings at this costs a fraction of the price I think £3.75 is well worth the chance. It's a beautiful deep berry shade which has fine flecks of gold in. perfect for the party season and for giving the cheeks that fresh flush glow. The 3rd and final pick of the bunch is Sleek Makeup Pomegranate. It's probably the most scariest to look at from the 3. Very pigmented so a light hand is a must when applying this to fair/medium skin tones. I love the vibrant deep plum/purple undertones, almost wine-like. It has a subtle shimmer/seen running through it which gives it an extra POP of power. It lasts well on the cheeks and would be great to wear on a night out. I love wearing it during the day when I have very little on my eyes. Again price wise you can;t complain it costs £4.49. I really hope you enjoyed this post! I have more Autumn Picks coming soon so here's a sneak peek what to expect! I would love to know your Autumn Blushers! I don't own any makeup items in plum colour but this post made me want to try. Maybe a blush would be easy for me to wear! waiting to see the autumn lip colors..
Great picks, I love the Sleek Pomegranate blush! :) Which is your favorite? I love berry tones. Really like the look of the sleek pomegranate blush.